The Regional Comprehensive Economic Partnership (RCEP) is a free trade partnership, which will open India’s markets to some of the largest economies in Asia- like China, Japan and South Korea. The RCEP is currently being negotiated between 16 countries- which includes ten ASEAN countries as well as other Asia Pacific countries include Australia, China, India, Japan, South Korea and New Zealand. RCEP has reached a major turning point as free trade is facing a legitimacy crisis across the world. After USA withdrew from the Trans-Pacific Partnership Agreement (TPP) (a similar initiative that included many Asian, but also American nations), RCEP remains as the main mega-regional agreement for Asian & Pacific nations. The RCEP agreement will be the largest in the world in terms of population (3.4 billion or 49 per cent of world population), with a combined GDP of around $22 trillion and a trade share of 30 per cent. India has been asked to remove import duties on 92% of all traded commodities. While India has been resisting and asking for 80%. A key controversial point is that once reduced to zero, the RCEP will not allow India to raise duties at a later date – a provision that even the WTO did not impose. Major agricultural products like fruits, vegetables, pulses, potatoes, spices, plantation crops, seeds, silk, sugarcane, as well as processed foods will be impacted, as cheaper imports from massive economies like China, Australia will flood the market damaging the livelihoods of local producers. The RCEP agreements are being negotiated behind closed doors; though several components of the texts under negotiation have been leaked online and have been analysed. The analysis indicates that the RCEP negotiations will impact agrarian economies in countries like India. 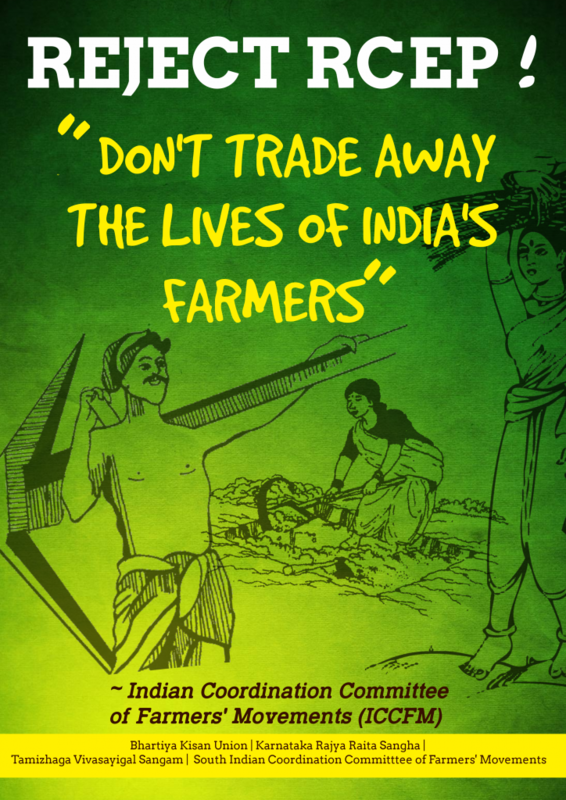 It is therefore important for the farmers groups to understand RCEP and its likely impacts on the livelihoods of small and marginal farmers. People in India, have already felt the brunt of liberalisation through earlier trade agreements, such as the multilateral WTO, India-ASEAN FTA and other FTAs. They have experienced the surge of imports of oil seeds and cash crops leading to loss of production and failure of market within the country. The mega regional FTA (RCEP) also raises concerns about pushing ‘WTO-plus’ issues on developing countries. This is when there is evidence of how existing WTO commitments in intellectual property (TRIPS), agriculture (AoA) and investment measures (TRIMS) have adversely impacted policy space and livelihoods. Apart from the global level, RCEP also raises Constitutional challenges at the state level where many of these sectors under negotiation fall under state jurisdiction. 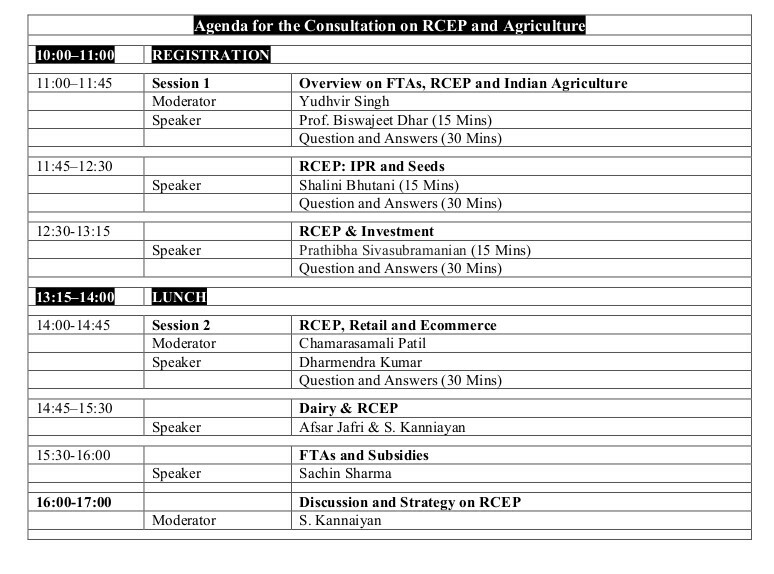 In this context several prominent peasant movements in India under the banner of Indian Coordination Committee of Farmers Movements (ICCFM) are holding a ‘National level consultation on the Impact of Regional Comprehensive Economic Partnership (RCEP) and other Free Trade Agreements (FTAs) on Farmers and Farming in India’ on 13th March in New Delhi. Indian Social Institute (ISI), 10 Institutional Area, Lodhi Road (Behind Sai Baba Mandir), New Delhi, to build our collective capacities on trade agreements in general and RCEP in particular. Representatives of of farmers organizations, representatives from government, ally researchers who have been closely following the negotiations will join the workshop.